Barnet boss Martin Allen believes the Cobblers are ‘a tremendous side’ and that they will be promoted at the end of this season. Allen brings his improving Bees side to Sixfields on Saturday (ko 3pm), aiming to complete a win double over Chris Wilder’s high-flying team. Barnet were 2-0 winners over Town at The Hive in August, and Allen is targeting a repeat of that success this weekend. But he knows his team will have to be at their best, as he rates the Cobblers, who go into the game in second place in Sky Bet League Two, very highly. “They’ve got good players,” said. Allen when asked about Northampton. “They’ve got a lot of players that I’ve made enquiries about, but they’re well out of our range. “Northampton are near the top of the league, and so they should be. “They’ve got good players right the way through their team and on their bench. 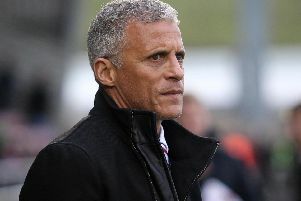 “Chris Wilder has put together a tremendous side. Striker John Akinde scored both goals in the Bees’ win over the Cobblers earlier in the campaign, and has 11 to his name this season. He has returned to form in recent weeks after a tough spell, and Allen believes there is more to come from the 26-year-old, who will be joined in the Bees attack by former Peterborough United frontman Aaron McLean. “John’s worked very hard on his game,” said the Barnet boss. “I think our recent change of formation and style has helped him. “The different way of playing has certainly helped him – he’s not having to do so much running, fighting and battling. “It’s also helped that Aaron McLean has been playing so well. “The pair of them have a nice little partnership going now, and John looks much happier. The Cobblers are expected to make a couple of changes for Saturday’s game, with former Barnet player Ricky Holmes set to make his first start of the season in place of Alfie Potter, who is struggling with a rib injury.